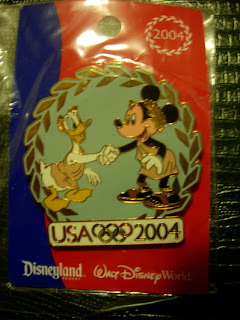 This is a Disneyland Olympic Pin from 2004, and was part of the 2004 Olympic Pin Series. This pin is an "NFFC Members Only" Pin, made by Disney for members of the the NFFC(National Fantasy Fan Club), and pictures Donald Duck and Mickey Mouse shaking hands. Limited to only 1000 pins, this pin is truly rare, and is also a particularly good-looking pin.